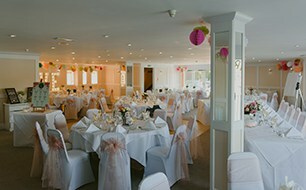 Each with its own unique and breath-taking view, all of our venue rooms are different with something to suit everyone. Our luxury wedding receptions all come with one thing in common: our impeccable standards of service. 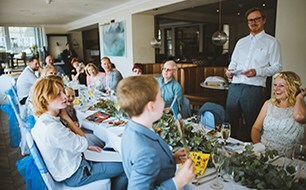 Our Executive Head Chef Nick Hodges has compiled a selection of wedding breakfast menus which reflect our focus on the freshest local produce, while the hotel’s accomplished bar team can craft a special celebratory wine and drinks menu, designed to perfectly complement your wedding. Please see below our room options and let us know if we can help in any way, by calling 01326 312440 or by emailing our Wedding Manager Jane. And at the end of the day, a sumptuous honeymoon suite awaits you as newlyweds. Expect the very best for your ﬁrst morning of married life. Lift your head from plush pillows and draw back the curtains to see sun-speckled waters, as you take in the fresh sea breeze. 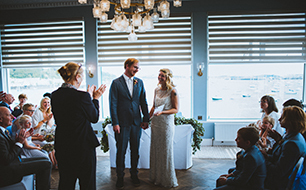 Our gift to you is a wedding night stay in a harbour view room, which overlooks Falmouth bay and Flushing. As well as this, we offer exclusive rates to your guests too. When it comes to comfort, character and convenience, The Greenbank’s rooms have it all. Chic, intimate and bursting with natural light, the bar and sun-drenched terrace are ideal for your drinks reception. Expect panoramic harbour views to stop you in your tracks, with the water just metres away. A bright room boasting full length windows and a balcony overlooking the water. Its natural decor acts as a beautiful blank canvas for your dream wedding theme. A great space for intimate, smaller celebrations, The Sundeck is perfect if you want the spirit of an outdoors occasion with the benefits of an indoors venue. "We arrived to be greeted by extraordinarily professional staff, in an all-out gorgeous hotel. We and our entire wedding party can attest: The Greenbank deserves all of the positive accolades they have."